Skillbill people are software developers. Thanks to their skills, they are able to cover many areas, from server software to complex user interfaces, mobile applications, mission critical field control software, streaming and multimedia applications and tools. 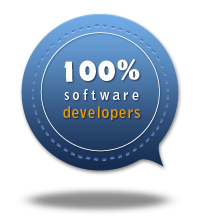 Software is a key element of their professional interests. Skillbill’s approach to business is very simple. The people working at Skillbill are passionate about software development and they want to be the best developers in the market and build awesome software which makes people happy. Skillbill invests in their technical skills to keep them updated on the latest technologies and to make sure they have a successful career.